What is guest blogging? This is a question you almost undoubtedly know the answer to. But you probably don’t know how useful a tool it is. Guest blogging is one of the primary ways a person can market themselves, as well as promoting their own site. Content is king, no matter where it is published, and a powerful link can bring you traffic steadily for a long time. Getting started can be a bit difficult, however. Especially if you have never done it before. Which is why you need to have someone who has been there to guide you along the way. Someone like MyBlogGuest founder Ann Smarty, who has been on the guest posting scene for years. 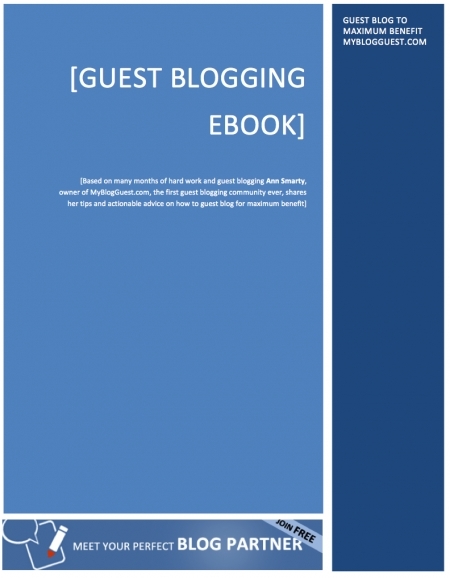 She has written a free ebook for anyone who wants to learn more about guest blogging. It explains everything you need to know about how to use guest blog posts to your advantage. Plus, it leads you through the process of finding, writing and submitting posts, and even tells you about brands who have done it for their own gains. Guest posting is a great way to improve your visibility, market yourself, build powerful links to your site and find a wider audience who will appreciate your writing. This ebook is absolutely free, no registration required, so check it out. Download the free guest blogging eBook today, there are no costs, sign-up forms or shares required. Also check out MyBlogGuest course for more tips and videos. Please share your reviews about book whenever you read this. I visited your blog for the first time and going mad over all your articles. I just downloaded this ebook as I am very fond of reading books related to my niche. Thanks for providing us such ultimate book. Thanks for sharing.